Governor Steve Bullock joined healthcare providers at North Valley Hospital in support of Initiative 185, October 15, 2018 in Whitefish, MT. Governor Steve Bullock was in Whitefish Monday stumping for a ballot initiative to fund Medicaid expansion through increased tobacco taxes. Standing in front of an array of candy-flavored vaporizers at North Valley Hospital, Bullock and a handful of healthcare professionals and a public school superintendent called Initiative 185 a “win-win” for ensuring Montanans have healthcare and reducing health impacts of tobacco products, especially among youth. “There is no unfunded mandate that occurs as a result of this. The money coming from this will actually go directly to help cover the state part of covering 100,000 Montanans with healthcare,” Bullock said. A 'no on I-185' sign at a Missoula gas station. Republican legislators sent Bullock a letter earlier this month asking him to pursue setting a work requirement for able-bodied adults and strengthening workforce training requirements. Bullock said those changes would need a legislative process but said he’s willing work with them to find solutions. 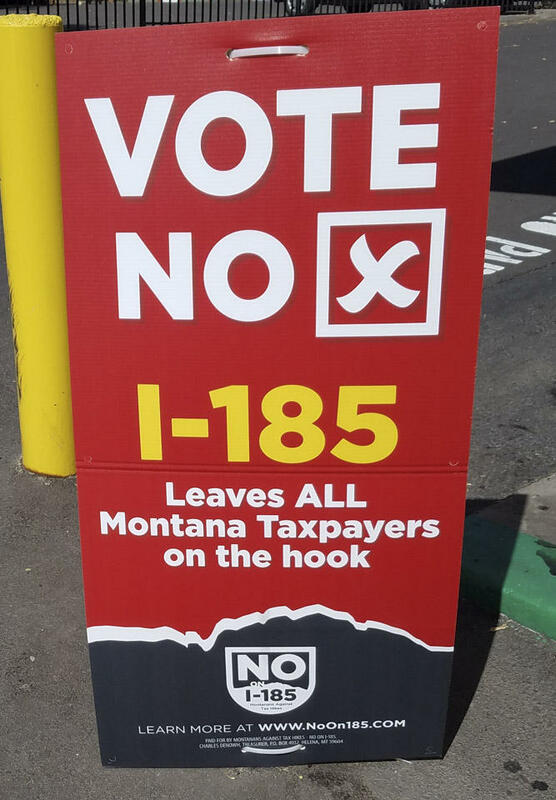 Montanans will vote on Initiative 185 in the upcoming November 6 midterm election.